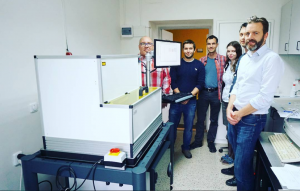 A MicroWriterML2 has been successfully installed in Prague, at the Institute of Photonics and Electronics, part of the Czech Academy of Sciences. The system is equipped with a 0.6 micron and 1 micron 405 nm lasers, as well as an additional 1 micron 375 nm laser for exposing SU-8 resist. A turbo assembly is fitted for exposing large areas very quickly. The system will help the Optical Biosensors in their research of photonic and plasmonic nanostructures and functional biomolecular files, the development of optical measuring methods and systems, the study of biomolecular interactions and detection of chemical and biological agents.